Jalaeikhoo, H., Kashfi, S., Azimzadeh, P., Narimani, A., Gouhari Moghadam, K., Rajaeinejad, M., Ariana, M., Keyhani, M. (2017). Acute Myeloid Leukemia as the Main Cause of Pancytopenia in Iranian Population. 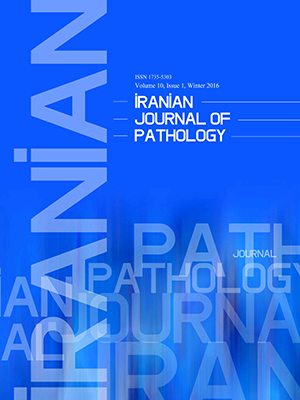 Iranian Journal of Pathology, 12(3), 265-271. Hasan Jalaeikhoo; Seyed Mohammad Hossein Kashfi; Pedram Azimzadeh; Ahmad Narimani; Katayon Gouhari Moghadam; Mohsen Rajaeinejad; Mehdi Ariana; Manouchehr Keyhani. "Acute Myeloid Leukemia as the Main Cause of Pancytopenia in Iranian Population". Iranian Journal of Pathology, 12, 3, 2017, 265-271. Jalaeikhoo, H., Kashfi, S., Azimzadeh, P., Narimani, A., Gouhari Moghadam, K., Rajaeinejad, M., Ariana, M., Keyhani, M. (2017). 'Acute Myeloid Leukemia as the Main Cause of Pancytopenia in Iranian Population', Iranian Journal of Pathology, 12(3), pp. 265-271. Jalaeikhoo, H., Kashfi, S., Azimzadeh, P., Narimani, A., Gouhari Moghadam, K., Rajaeinejad, M., Ariana, M., Keyhani, M. Acute Myeloid Leukemia as the Main Cause of Pancytopenia in Iranian Population. Iranian Journal of Pathology, 2017; 12(3): 265-271. Background & objective: Pancytopenia is the reduction in the number of all 3 major cellular elements of blood and leads to anemia, leukopenia, and thrombocytopenia. A wide variety of etiologies result in pancytopenia including leukemia, aplastic anemia, and megaloblastic anemia. The current study identified the different etiologies of pancytopenia based on bone marrow examination in Iranian patients with pancytopenia. Methods: A total of 683 cases of pancytopenia with various etiologies were selected for this retrospective study. Bone marrow biopsy was performed with the standard technique using Jamshidi needle. The inclusion criteria for patients with pancytopenia were hemoglobin (Hb) 9/L, and platelet count 9/L. Results: In the present study acute leukemia was the first most common etiology detected in 235 (35.4%) patients in which acute myeloid leukemia (AML) comprised the majority of cases 142 (21.4%), followed by myelodysplastic syndrome (MDS) 100 (15%). In patients less than 20 years old, acute leukemia was also the commonest cause identified in 56 (57.7%) cases in which acute lymphoblastic leukemia (ALL) with 38.7% was the most common etiology; however in adults (>45 year old), AML accounted for the majority of cases 76 (53.5%). Conclusion: Since acute leukemia was the commonest etiology in both young and adults in which AML accounted for the majority of cases with pancytopenia in Iranian population, there was an urgent need to identify the underlying molecular or genetic mechanism of this malignancy for better further medical management and patients` survival. 1. DM. W, Pancytopenia, Aplastic anemia and Pure red cell aplasia., ed. W.s.C. Hematology. Vol. 10th Ed. 1993, Baltimore: William and Willkins. 1449- 84. 2. Ishtiaq O, Baqai H Z, Anwer F, and Hussain N. Patterns of pancytopenia patients in a general medical ward and a proposed diagnostic approach. J Ayub Med Coll Abbottabad 2004; 16(1): 8-13. 3. Alter B P. Fanconi's anemia and malignancies. Am J Hematol 1996; 53(2): 99-110. 4. Jha A, Sayami G, Adhikari R C, Panta A D, and Jha R. Bone marrow examination in cases of pancytopenia. JNMA J Nepal Med Assoc 2008; 47(169): 12-7. 5. Gupta V, Tripathi S, Tilak V, and Bhatia B D. A study of clinico-haematological profiles of pancytopenia in children. Trop Doct 2008; 38(4): 241-3. 6. Pizzo PA D A A, The pancytopenias. Nelson textbook of pediatrics. Vol. 17th ed. 2003, Behrman RE: Kleigman RM, Jenson HB. . Philadelphia: Saunders. 7. Bhatnagar S K, Chandra J, Narayan S, Sharma S, Singh V, and Dutta A K. Pancytopenia in children: etiological profile. J Trop Pediatr 2005; 51(4): 236-9. 8. Tilak V and Jain R. Pancytopenia--a clinico-hematologic analysis of 77 cases. Indian J Pathol Microbiol 1999; 42(4): 399-404. 9. Varma N and Dash S. A reappraisal of underlying pathology in adult patients presenting with pancytopenia. Trop Geogr Med 1992; 44(4): 322-7. 10. Safaei A, Shokripour M, and Omidifar N. Bone marrow and karyotype findings of patients with pancytopenia in southern iran. Iran J Med Sci 2014; 39(4): 333-40. 11. Gayathri B N and Rao K S. Pancytopenia: a clinico hematological study. J Lab Physicians 2011; 3(1): 15-20. 12. Hayat AS K A, Baloch GH, Shaikh N. Pancytopenia;. study for clinical features and etiological pattern of at tertiary care settings in Abbottabad. Professional Med J 2014; 21(1): 060-65. 13. Santra G and Das B K. A cross-sectional study of the clinical profile and aetiological spectrum of pancytopenia in a tertiary care centre. Singapore Med J 2010; 51(10): 806-12. 14. Ito S, Takada N, Ozasa A, Hanada M, Sugiyama M, Suzuki K, et al. Secondary hemophagocytic syndrome in a patient with methicillin-sensitive Staphylococcus Aureus bacteremia due to severe decubitus ulcer. Intern Med 2006; 45(5): 303-7. 15. Keisu M and Ost A. Diagnoses in patients with severe pancytopenia suspected of having aplastic anemia. Eur J Haematol 1990; 45(1): 11-4. 16. Nafil H, Tazi I, Sifsalam M, Bouchtia M, and Mahmal L. [Etiological profile of pancytopenia in adults in Marrakesh, Morocco]. East Mediterr Health J 2012; 18(5): 532-6. 17. Thakkar B B, Bhavsar U N, Trivedi N, and Agnihotri A. A Study of Pancytopenia in Adult Patients More than 12 Years of Age in North West Region of Saurashtra. National Journal of Medical Research 2013: 48. 18. Redaelli A, Laskin B L, Stephens J M, Botteman M F, and Pashos C L. A systematic literature review of the clinical and epidemiological burden of acute lymphoblastic leukaemia (ALL). Eur J Cancer Care (Engl) 2005; 14(1): 53-62. 19. Yamamoto J F and Goodman M T. Patterns of leukemia incidence in the United States by subtype and demographic characteristics, 1997-2002. Cancer Causes Control 2008; 19(4): 379-90. 20. Mirzai A Z, Hosseini N, and Sadeghipour A. Indications and diagnostic utility of bone marrow examination in different bone marrow disorders in Iran. Lab Hematol 2009; 15(4): 38-44. 21. Ley T J, Ding L, Walter M J, McLellan M D, Lamprecht T, Larson D E, et al. DNMT3A mutations in acute myeloid leukemia. N Engl J Med 2010; 363(25): 2424-33. 22. SEER Cancer Statistics Factsheets: Acute Myeloid Leukemia. National Cancer Institute. Bethesda, MD,. 23. Altekruse S, Kosary C, Krapcho M, Neyman N, Aminou R, Waldron W, et al. SEER cancer statistics review, 1975-2007. Bethesda, MD: National Cancer Institute 2010; 7. 24. Ries L A G, Smith M A, Gurney J, Linet M, Tamra T, Young J, et al. Cancer incidence and survival among children and adolescents: United States SEER Program 1975-1995. Cancer incidence and survival among children and adolescents: United States SEER Program 1975-1995 1999. 25. Dash A and Gilliland D G. Molecular genetics of acute myeloid leukaemia. Best Pract Res Clin Haematol 2001; 14(1): 49-64. 26. Gilliland D G and Tallman M S. Focus on acute leukemias. Cancer Cell 2002; 1(5): 417-20. 27. Dohner H, Estey E H, Amadori S, Appelbaum F R, Buchner T, Burnett A K, et al. Diagnosis and management of acute myeloid leukemia in adults: recommendations from an international expert panel, on behalf of the European LeukemiaNet. Blood 2010; 115(3): 453-74. 28. Chiste M, Vrotsos E, Zamora C, and Martinez A. Chronic lymphocytic leukemia/small lymphocytic lymphoma involving the aortic valve. Ann Diagn Pathol 2013; 17(3): 295-7. 29. Rangaswamy M, Prabhu, Nandini N M, and Manjunath G V. Bone marrow examination in pancytopenia. J Indian Med Assoc 2012; 110(8): 560-2, 66. 30. Ma X, Does M, Raza A, and Mayne S T. Myelodysplastic syndromes: incidence and survival in the United States. Cancer 2007; 109(8): 1536-42. 31. Sekeres M A, Schoonen W M, Kantarjian H, List A, Fryzek J, Paquette R, et al. Characteristics of US patients with myelodysplastic syndromes: results of six cross-sectional physician surveys. J Natl Cancer Inst 2008; 100(21): 1542-51. 32. Weinzierl E P and Arber D A. Bone marrow evaluation in new-onset pancytopenia. Hum Pathol 2013; 44(6): 1154-64. 33. Doshi D, Shah A N, Somani S, Jain A, Jivarajani H, and Kothari P. Study of clinical and aetiological profile of 100 patients of pancytopenia at a tertiary care centre in India. Hematology 2012; 17(2): 100-5. 34. Incidence of aplastic anemia: the relevance of diagnostic criteria. By the International Agranulocytosis and Aplastic Anemia Study. Blood 1987; 70(6): 1718-21. 35. Khan F S and Hasan R F. Bone marrow examination of pancytopenic children. J Pak Med Assoc 2012; 62(7): 660-3. 36. Pine M and Walter A W. Pancytopenia in hospitalized children: a five-year review. J Pediatr Hematol Oncol 2010; 32(5): e192-4. 37. Arcaini L, Zibellini S, Boveri E, Riboni R, Rattotti S, Varettoni M, et al. The BRAF V600E mutation in hairy cell leukemia and other mature B-cell neoplasms. Blood 2012; 119(1): 188-91. 38. Brochamer W L, Jr. and Keeling M M. The bone marrow biopsy, osteoscan, and peripheral blood in non-hematopoietic cancer. Cancer 1977; 40(2): 836-40.